As you use your Mac and continue to install new software you may find that your Menu Bar, which is the topmost menu on your screen, can get really crowded. Also, since the menu does change to reflect the active program, the number of items visible on the right side can change and even obscure some of your running programs. No worries though, for a few bucks you can pick up a really great piece of software called Bartender which helps keep your menu bar nice and tidy. Once installed, here’s how to configure it to show or hide individual programs. In addition, you can also move lesser used items to what is known as the Bartender Bar so they are still easily accessed but generally hidden for the bulk of the time. Look at all that stuff up there. Some of it Apple has decided I need and some are there from other programs I have installed. Some are really important and some much less so. 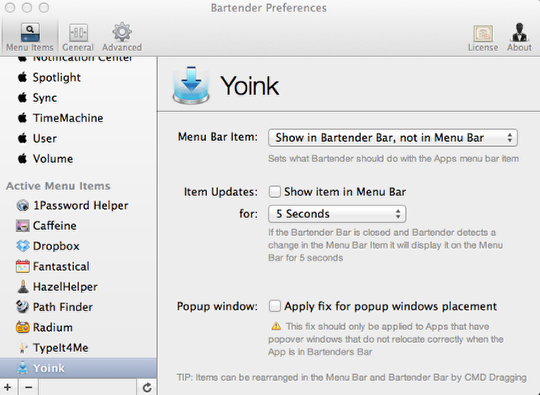 When Bartender is open you can click on the icon to expose the Bartender Bar and then click the preferences cog icon. Note, you can modify the Bartender icon but the three dots is the default. Let’s Look At Our Options! On the left side you’ll see your running System Items followed by the Menu Items for your own software. Each one can be set individually by choosing the most relevant option. The default option is to do nothing which leaves the icon in the main menu. This is the case here, I want my AirPlay Display to be active and visible so I will leave the default to have Bartender not do anything. 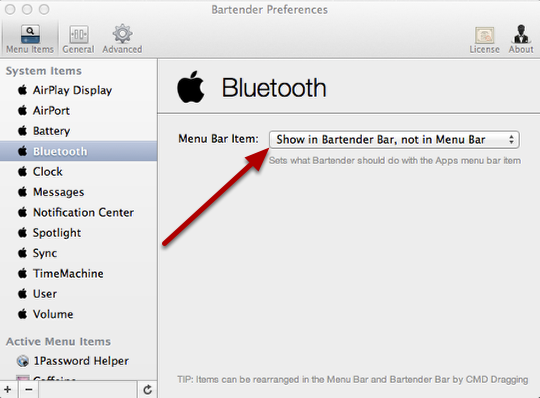 The next option will move the icon down to the Bartender bar, removing it from the Menu Bar. For something like Bluetooth which I rarely use I decided this is the best option so that it can be accessible if needed but is generally out of my way. I use this option for all things that I don’t necessarily need to monitor. 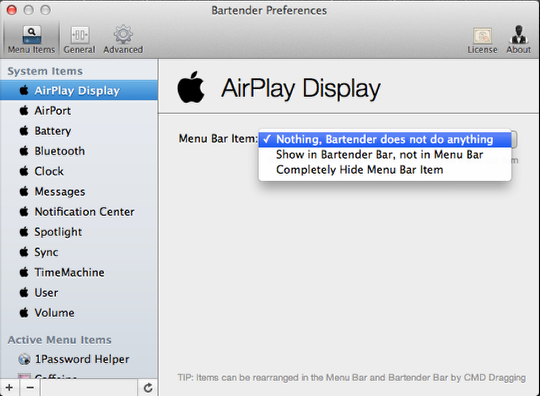 Our next option will remove the item from Menu Bar without moving it to the Bartender Bar. This is a great option for those things which you really need no access to. For example, since I am the only user on my Mac and generally know my name without the need for a prompter, I go ahead and hide items like the User Name altogether. The Active Menu Item options are a bit more robust than those for the Apple System programs by adding behavior for Item Updates. This option will temporarily move an icon to the Menu Bar if there is a change in the icon status. For example I use Dropbox to keep data in sync with other devices and to share working documents with colleagues and friends. I generally don’t need to have the Dropbox icon visible but it is nice to receive some sort of visual notification if there is activity in the program. 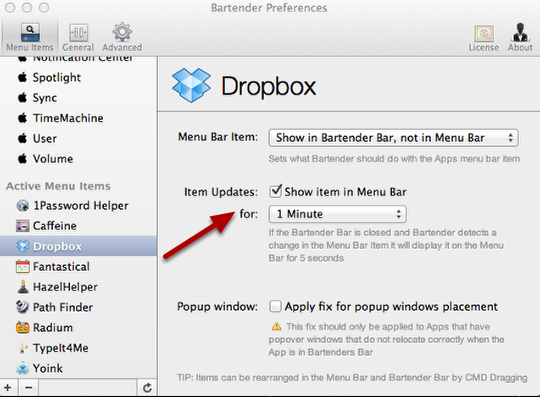 By checking the “Show item in Menu Bar” option and settng a time along with it, the Dropbox icon will usually remain in the Bartender Bar. If however the icon changes, like it does when it is syncing new data, Bartender will move the icon up in to the Menu Bar for 1 minute as a means to notifiy me of that activity. 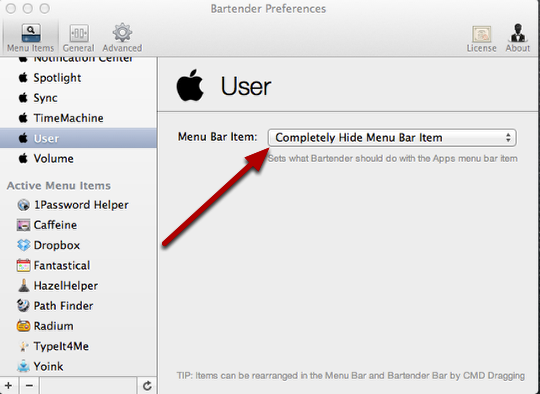 All applications that have placed an icon in the Menu Bar will appear here for modification by Bartender. Move through the list one by one until you have set the behavior you would like for each program. By moving lesser used items to the Bartender Bar or removing them entirely, your main Menu Bar is easier to navigate, easier to monitor, and much more compact. Bartender is a great little utility by Surtees Studio and is available via their web site for $15.00 – There is a generous 4 week trial available.